The Star Wars saga is something of a phenomenon in our department. A student walking in our halls could very well hear conversations among various members of the department about which of the original six films is best, and who, acting in the role of Anakin, could have saved Episodes I, II, and III. For the intermediate student, at the 200-level, the debate about the saga is elevated to questions regarding whether Han or Greedo shot first (Han, of course) or who is the most intimidating bounty hunter (undoubtedly, Dengar). At the 300-level, the discourse is about old canon versus new—the hermeneutics of Star Wars. Of course such discussions reached a fever pitch in the months surrounding the December 2015 release of Episode VII, Star Wars: The Force Awakens, and there is among the denizens of the History Department at least one individual who can number her theater viewings of the film in the double digits. I have been a fan since I was four, and I am proud to say that I saw Return of the Jedi in the theater when it was originally released in 1983. (I was only one when the original Star Wars premiered.) 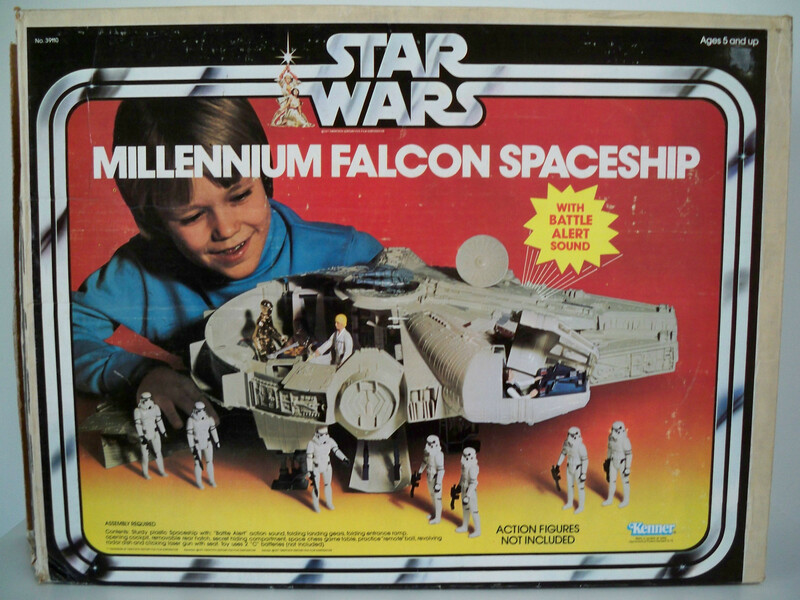 Some of my earliest toys included the original Kenner Millennium Falcon and some two dozen action figures, including the version of C-3PO whose limbs and head could be removed and placed in a vinyl mesh backpack, presumably to be carried by Chewbacca for later repair. Even now, I relive my childhood through my two sons and the Star Wars Lego sets that I frequently purchase for…them. What I would have given as a young child for Star Wars Lego parts, I can’t even imagine. Try building an X-Wing or a TIE Fighter with old-school Lego Town sets. It just doesn’t work. As a historian of the ancient Mediterranean, I am particularly attuned to themes in George Lucas’s imagined world that echo the Roman past. Fans and scholars alike have noticed and even written about the intersections between the films and history, with the most obvious, and tantalizingly interesting, being the transition from Republic to Empire. (See, for example, the insightful essay by Michael Charles, “Remembering and Restoring the Republic: Star Wars and Rome.”) And so when I was “commissioned” to write on our department blog about Star Wars and ancient Rome, I had the feeling that I had come full circle with my own past and present. My own specialty is a period we call “Late Antiquity,” comprising roughly the years between 250 and 650 CE; and as I reflected further on the place of The Force Awakens in the mythology of Star Wars, I realized that it is a film about the late antiquity of the Galactic Empire. So far I have found only one blog post about this idea written by a medievalist, and so I hope that I can add to the conversation. It would be a foolhardy exercise to try and identify one-to-one correspondences between Roman history and any aspect of the Star Wars films (just as it would be with respect to contemporary America), and so my goal is less about “this equals that” and more about thematic thinking. Indeed, many of our students who take our introductory courses in world history assume they will get a repeat of their high-school experiences: an exhaustive and exhausting list of names and dates to memorize and regurgitate on exams. But I hope they discover that the work, indeed the joy, of history is found not in the rote memorization and recall of data, as important as they are, but in the big picture questions and interpretations. This is the essence of historiography, that is, the study of the interpretive frameworks and the resulting questions that historians bring to their reading of the sources, written and material. I would also like to suggest, even if just as a thought exercise, that we can apply the principles that guide our interpretation of history to the fictional universe of Star Wars. The concept of “Late Antiquity” has roots in the early twentieth century but truly found its voice in the scholarship of Peter Brown, who examines this period of ancient Mediterranean history not through the lens of decline and fall, but of continuity and transformation. The narrative of decay in many ways owed its existence to the eighteenth-century work of Edward Gibbon, whose central idea was that the fall of the Roman Empire had much to do with a societal shift in priorities, away from the traditional values and virtues that had made it so successful to the otherworldly anticipation of a future life, as articulated by the Christian faith. Brown’s thesis complicated this storyline. Since the mid-2000s, scholars have challenged the “explosion” of Late Antiquity into a period far longer and far wider than the evidence necessarily suggests, especially for the western half of the Empire. While historians inspired by the Brown paradigm have explained the movement and settlement of “barbarians” and the foundation of their kingdoms in terms of continuity and transformation, this recent scholarship has reintroduced into the interpretive framework words like invasion, collapse, decline, and fall. The continuity model certainly sees dates like 410 (the sack of Rome by the Visigoths) and 476 (when the last western emperor, Romulus Augustus, was deposed) as important events, but not catastrophic end-of-the-Empire moments. Others, however, view them as significant indicators that something indeed had ended and a new dispensation inaugurated—the Middle Age. 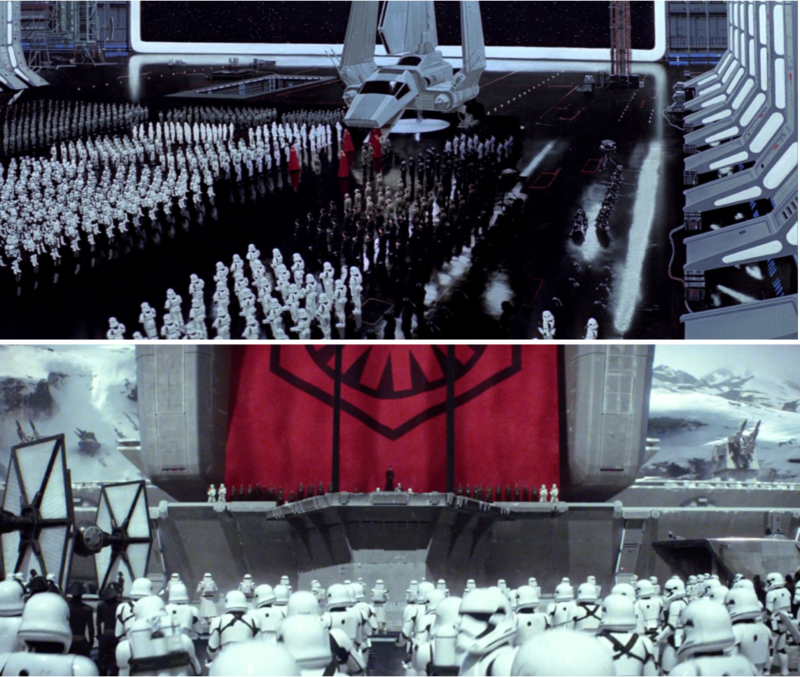 Above: Imperial stormtroopers and other officers greet Emperor Palpatine in Return of the Jedi. Below: First Order stormtroopers gather for a demonstration on Starkiller Base in The Force Awakens. So to return to The Force Awakens, we might view the devastating events of the Battle of Yavin and the destruction of the first Death Star, and the Battle of Endor, the annihilation of the second Death Star, and (presumed) death of the Emperor Palpatine, as 410- and 476-like moments of the Star Wars saga. Episode VII, which takes place some thirty years after the death of Darth Vader, depicts a new “menace,” whose shock troops appear remarkably similar to the stormtroopers of old. Yet in addition to innovative equipment heretofore unseen—flame-throwers, riot gear, and two-person TIE Fighters—there is a noticeable change that has taken place, both on the surface and underneath. In the case of stormtroopers and the Imperial administration, the noticeable presence of women – quite powerful in the person of Captain Phasma – reveals to the audience both a sense of continuity with the pristine white armor and faceless (male/clone) warriors and officers of the Empire and change into something else. Kylo Ren’s red lightsaber, with its bladed hilt, has a similar effect. The idioms and symbols of the old Empire are very much present in the new order, but at the same time they are expressed in novel forms with different meaning. This is, in many ways, at the heart of the historiography of Late Antiquity. If we follow the parallel with the Roman world, then the losses suffered at Yavin and Endor were perpetrated by the “barbarians” of the Star Wars universe, known collectively in Episodes IV-VI as the Rebel Alliance, whose goal was to cast off the oppressive regime of the Imperial conquerors. In the Star Wars saga, there seems to be a clear moral distinction to be made between the Empire and the dedication of its prime leaders to the Dark side of the Force, and the Rebels, who represent justice, freedom, and ultimately good, the Light side. However, when we dig a bit deeper, we can detect a certain ambiguity, and the binary of the Dark and Light side of the Force as representative of evil and good is not so cut and dry. The narrative arc of Anakin Skywalker to Darth Vader and back to Anakin and his messianic role are not necessarily framed as the complete triumph of good over evil, but rather as a return to “balance” in the Force. Furthermore, the internal struggles of Luke Skywalker invite further reflection on the opacity of right versus wrong. In The Empire Strikes Back, Luke decides against the urging of Yoda and a ghostly Obi-Wan to finish his training on Dagobah, which would have meant certain doom for Han and Leia, and ultimately “saves” his friends – and ultimately his father Anakin, and thus the galaxy – in Return of the Jedi. Yoda and Obi-Wan, clear representatives of the Light side, argue that the greater good and ultimate goal are worth the sacrifice of a few, but we remain sympathetic to Luke’s decision. Skywalker, by giving in to his anger and hence a turn to the Dark side, at least for a moment, was able to overcome Vader’s loyalty to Palpatine. This is the kind of deeper philosophical reflection that makes the saga so fascinating and in many ways, timeless. 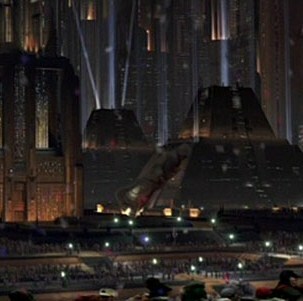 A statue of Emperor Palpatine on the capital planet Coruscant is toppled in celebration at the end of Return of the Jedi. With respect to the Romans and “barbarians,” we are left with a similar sense of moral uncertainty. The former claimed to have civilized and brought order to the known world, but at the same time they were oppressive and exploitative. The ambiguity is further complicated by the ascendancy of Christianity in the fourth century, when the apparatus of the state and its potentially coercive powers were combined with the interests of the church. Were the Romans the bad guys or the good guys? Dark side or Light? The barbarians, when we do “hear” their voices in the sources, seem to justify their resistance as a fight for freedom and liberty. And so it is not difficult to sympathize with their cause against the Romans, whom we nevertheless admire as the progenitors of western culture. In The Force Awakens, the First Order appears even stronger than the Empire of Palpatine, and it is engaged throughout the film in the business of “reconquest,” or in some cases, complete annihilation of planets and systems it had lost. These efforts invite some reflections on the long Late Antiquity/Byzantine tension mentioned above. The Roman Empire did not end in 410 or 476, but continued for another millennium, centered in Constantinople. Around 533, the emperor Justinian, inaugurated a reconquest of the lost territories in the western half of the Roman Empire. This effort was led by the general Belisarius, and after about two decades the Romans recaptured most of north Africa, Italy, and a strip of land in Spain. Ultimately, these efforts proved to be in vain, and soon thereafter the Romans, distracted by concerns on the eastern frontier and with their resources spread too thin, ceded what they had regained for good. No longer would these western lands be ruled by the imperial Roman state, but this does not mean that they were not ruled with (changing) Roman idioms and symbols. They were, but by people whom the Romans would have considered barbarians. Meanwhile, at Constantinople, the Roman Empire continued well into the fifteenth century, preserving, adapting, and transforming the traditions of the classical past. So, will the reconquest of the First Order also be the last gasp of the old Empire, trying to regain its former glory but ultimately forced to retreat to a much smaller corner of the galaxy? Will the Resistance, led by an older Luke Skywalker, establish a new Republic? Or will supreme leader Snoke and his Belisarius, Kylo Ren, succeed and usher in a renewed, unified Galactic Empire? This remains to be seen. And until then, “May the Fourth” be with you. This entry was posted in Young Kim and tagged Byzantine, empire, history, History and Star Wars, Late Antiquity, Roman Empire, Star Wars, the First Order, the Rebel Alliance. Bookmark the permalink.